Pressing the Alt and Tab button together allows you to quickly switch from the window you're currently looking at to another window, which is useful when you don't want your boss or nosey friends to see what you're working on (or not working on if you're at work). It's also a time-saver when you don't want to take your hands off the keyboard to switch to another window. 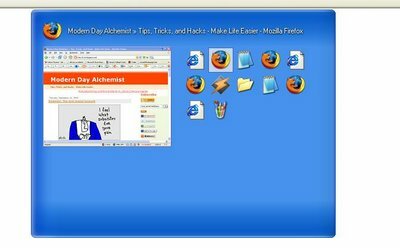 However, it's not always easy to tell which window you're switching to especially when you have multiple windows open such as 10 Firefox windows or 3 Notepad windows. To remedy this, you can get the Alt-Tab replacement that Microsoft has released as unsupported upgrade to Alt-Tab switching that not only shows you the application icon, but also a thumbnail of the application window as well. If you have many browser windows open like I do, this will help save a lot of time when trying to track down the right window. Update: An anonymous commentor suggests TaskSwitchXP as a superior alternative. Windows are presented as a list along with the window title. It's also open source. Much better, improved features and open source too! There is also a little "fairly inexpensive" utility called - TopDesk by Otaku Software. Very slick, but you have to pay for it after the trial and it does impact performance on slower machines. But really nice eye candy. The 'thumbnail' view of all your windows is very usable.